Scotty the T-Rex, the biggest, the oldest, the most terrifying ever found - and female? He was 13 meters long, over twice as tall as you and weighed almost nine tons, back when he lived in Saskatchewan 66 million years ago. Despite his imposing bulk, he had clearly suffered in life – and was he fat? His skeleton was found back in 1991, but extracting a tyrannosaurus from encasing rock using micro-tools is time-consuming. After a decade of painstakingly chipping away, one might assume the University of Alberta paleontologists nicknamed the mega-rex Scotty after their intrepid first author W. Scott Persons. But they did not. The dinosaur was named for a celebratory bottle of scotch the night he was discovered, the scientists explain in The Anatomical Record. They elaborate that after “careful measurements” of legs, hips, and even shoulder, Scotty comes out “a bit heftier” than other T-rex specimens. Sue, the previous record-holder of biggest T-rex, had measured 12.3 meters nose to tail-tip and stood 4 meters tall. She had been nicknamed not for an alcoholic beverage or a science-denying politician, but for the explorer who discovered her in South Dakota, Sue Hendrickson. Much argument subsequently ensued about whether Sue (the T-rex, not the explorer) was lanky or beefy: the relatively recent analyses have leaned toward the lean. Scotty, on the other hand, seems to have been a load. They are also unsure about T-rex and the sexes. One might assume Scotty is male and Sue is female, but it isn't necessarily so. Once upon a time, paleontologists thought T-rexes might have had sexual dimorphism and that the robust ones were the ladies, which needed wider pelvises to lay their eggs. Upon discovering that latter-day crocodiles are not consistently sexually dimorphic, however, it is becoming clearer that we cannot make any assumptions about tyrannosauruses or any other dinosaurs. They may have been dimorphic, they may not have been, or some may have been. A paleontologist spearheading the criticism of dinosaurial dimorphism, Jordan Mallon, explained in Paleobiology in 2017 that there were clearly sexual differences: if a dinosaur skeleton is found with fossil eggs in the fossil abdomen, the dinosaur was female. But his examination of nine dinosaur species found no sexual dimorphism – though he meticulously adds that it may well have existed, we just haven’t found the evidence yet. The bottom line is we cannot make blank assumptions and in short, we don’t know that Sue was female or that Scotty is male. As for Scotty, the scientists also claim that he or she is the oldest T-rex found to date. “By which I mean, it would have had the most candles on its last birthday cake,” Persons said. 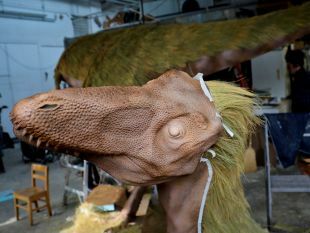 “You can get an idea of how old a dinosaur is by cutting into its bones and studying its growth patterns. Scotty is all old growth.” Which means he died in his 30s, they estimate. Turtles and some sharks may live hundreds of years but not the predatory mega-dinosaurs, which experienced short, intense and violent lives. Marks left on his mineralized bones led the paleontologists to conclude that Scotty experienced broken ribs, an infected jaw, and somebody had badly bitten his tail. We do not know who. Size may have been key to another question, not relevant to Scotty personally but to his ilk. Did the fearsome T-rex have feathers? Discoveries that feathers were not confined to the dinosaur group that evolved into birds, but were more widespread, has led to the postulation that being feathered was the base dinosaurian condition. Which may be true, but the question is whether certain dinosaurs continued to evolve in the direction of losing their feather covering in favor of scales, for instance. Some postulate as proof that the T-rex, at least in adulthood, may have been too big to need or even physiologically tolerate the heating effect of feathers and would have lost them in adulthood, with the possible exception of down around the ankles, like modern chickens. 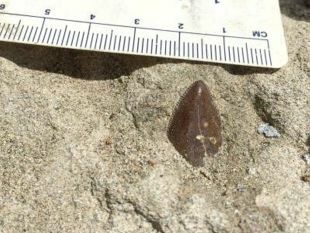 Indeed, fossil rex skin has been found, and it was scaly. However, rex babies probably featured down, like large fanged ducklings. Size leads us to a last point: analysis of Scotty’s remains, as a mature adult, indicates that paleontologists have been underestimating dinosaurian dimensions, say the scientists. Sometimes there’s no doubt: some things just aren't juvenile. Earlier this year a slim, gracile, tiny rex was reported, from Utah. The wee killer stood a mere 3 to 4 feet tall, weighed about 75 kilos (around 170 pounds) and had cute little slim feet on which it probably ran very, very fast to chase down its hapless prey. It lived about tens of millions of years before the tyrannosaurus rose to supremacy, which doesn’t mean it was Scotty’s ancestor, just that it could have been. And no, we don’t know if it was a boy or a girl, just that you wouldn’t have wanted to run into it on a dark night.